The guys from RadiantStar – the company that is making the 3Dfier DirectShow filter for realtime 2D to 3D video conversion have just released two new versions of the filter to compliment the already available one that was designed for 3D Vision owners. One is for Passive Polarized Displays like the ones found on Zalman Trimon 3D monitors and Acer Aspire 3D notebooks and the other one is for Anaglyph red-cyan glasses. These two are currently available only as demo versions for personal testing and still are not being sold like the 3D Vision version. Also for these two you don’t need to use a stereoscopic player, you can just use them with a normal video player that can load the required DirectShow filters like Media Player Classic for example. And with the Anaglyph red-cyan glasses demo version there is no time limitation on how long it will play so you can watch whole movies with it. Hey! I just tried this with nVidia Vision 3D Glasses. Seems to work but how does this filter convert 2D to 3D? I don’t understand this. The filter is using some basic principles to create the illusion of actual depth on the objects from 2D video automatically. If you are having trouble with it, then you better not use it anymore. It looks good in ~10% of the scenes of movies I’ve tried, but for the most part it just confuses your brain and eyes. It can’t be healthy telling your eyes and brain different conflicting cues for depth. I think it is quite impressive still. I just checked the polfilter version with my trimon. What I find quite a bit disturbing is, that I have alot of ghosting! So, I am quite interested in the theory behind their conversion method. Not much about that on the website. I noticed they make use of pulfritch, it is switchable in the filter. Also, I am missing the possibility to adjust at least one or two parameters, like in the tridef player. Did enyone compare the results to those of the fast modes of 3D Combustion? I just downloaded and installed the 3DFier demo. 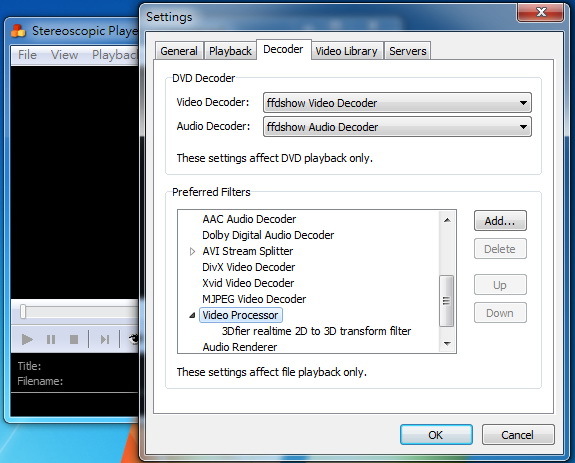 The authors need to include instructions on how to use the codec with the NVIDIA Stereoscopic 3D Video Player. I’m also having trouble using it with the 3dtv Stereoscopic Player. I added the 3DFier codec in the 3DTV SP settings menu as illustrated, but it doesn’t seem to be doing anything when I play a working 5-minute 4GB uncompressed AVI file. I’d post this at the 3DFier blog, but I’d rather not enter my Google account just to post a question.